An ultrasonic leak detector is a special type of leak detector which uses ultrasonic waves to detect leaks both in vacuums and high pressure environments. Unlike other commonly used sniffer type detectors which cannot go above 40.5Khz this one has a far better frequency range. These types of leak detectors are often used to detect leaks in a system of pipelines carrying compressed gas. Ultrasonic detectors are also available in a number of different types and sizes with the smaller ones intended for small refrigeration units and compressed natural gas vehicles. Larger versions are used to detect leaks in large gas and oil pipelines. Which is the best ultrasonic leak detector? This is a common question but it has a lot to do with what the detector will be used for. If you are just going to use it a few times a year around the house you’re better off purchasing a small detector which should be able to detect leaks in most household items. However, if you need a detector to be used in the field i.e. to detect leaks in large natural gas, compressed gas and vacuum systems then you’ll need to invest in a larger and better detector. In most cases this is something in which you should get your company’s technical team involved in. 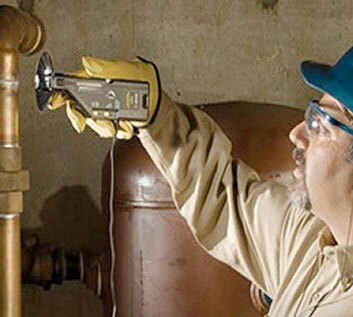 How much can an ultrasonic leak detector cost? The cost of an ultrasonic detector can vary depending on its make, type and features. The price of a detector can range anywhere from $50 to over $1000. The cheaper detectors are usually manufactured aboard in places like China but have a far shorter lifespan. If you are looking for a durable detector to be used around the house it would be a good idea to purchase one manufactured locally, as these detectors are durable and more accurate. You can also search for a detector online; there are many online retail stores which sell detectors at far cheaper prices than what you can find at conventional stores. But you should always read the specifications of a detector in order to ensure that it suits your needs appropriately before you purchase. A portable detector is mostly used to detect leaks in small system such as your air-condition unit, your deep freezer etc. These detectors do not cost more than a few hundred dollars if you are purchasing one made n the US or probably around $60 if you are purchasing one made in China. However, oftentimes these detectors may not be very accurate and so you’ll need to take a number of readings in order to find out for sure if there is a leak. An ultrasonic leak detector is not hard to find, and if you tell a store what you need it for they should be able to help you find the right detector.